Enjoy a few affordable and simple table decorations that you can easily create for all your spring entertaining. We always host Easter dinner at our house and I love having the chance to decorate our dining room table for this occasion. It’s a nice size room with a large table and many of my houseplants but we hardly ever use it. Spring is especially fun because I get to work with amazing spring flowers. 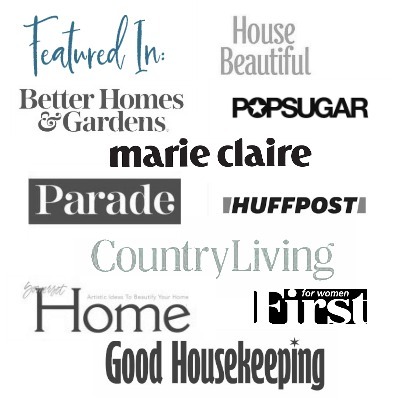 Today I’m touring with a great group of bloggers sharing spring ideas! A big thanks to Angie at Postcards From the Ridge for putting this tour together! 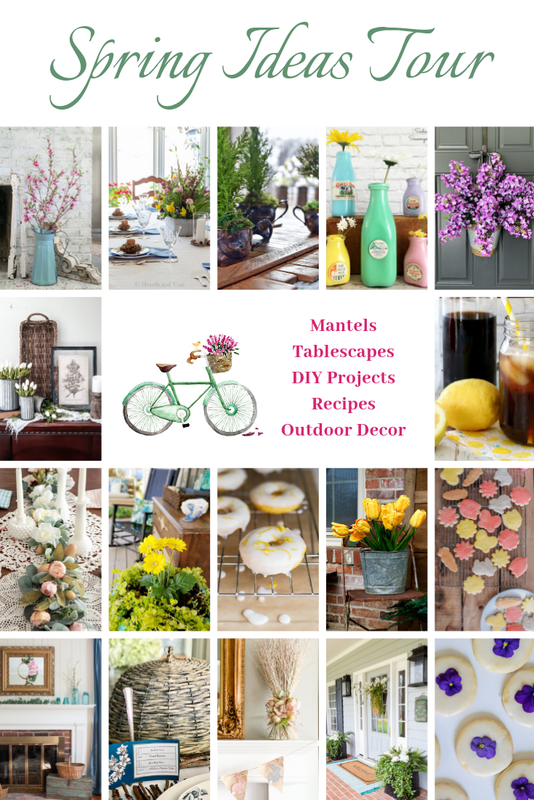 Make sure you check out all the spring inspiration at the bottom of the page! This spring table decor is super easy and affordable. I hope you are inspired to create something for your own home from the ideas shown here today. Did you notice the huge Easter centerpiece? I used a bunch of small bottles and a couple of empty tomato paste cans in this galvanized container to hold them in place. You could make this arrangement several days in advance and when you are ready to eat simply move the entire centerpiece to another table. Don’t have a galvanized tub? No problem. Any container will work. A narrow box or even a bright colored plastic bin would work. The flowers were purchased at Trader Joe’s for about $25. Not bad for 6 bunches of flowers. However, you probably already have some daffodils and other spring flowers in your backyard. Use them instead to cut down on the cost. Branches from flowering shrubs and trees work great too. I also had a couple of cell packs of pansies and violas leftover from a flower pounding project that I will share with you next week. They were perfect for sticking around the edges to fill in the empty space and hide the containers underneath. You could also stick some moss in and around the base to use as filler. Last week I wrote about using eggshells as seed starting planters for Easter favors. Here they are. Don’t they look great on top of this place setting? The nests are made with simple moss that you can get at the dollar store. I used spray adhesive to help hold them together. It’s a little messy to work with so cover your workspace and wear disposable gloves. The cute wildflower plates were a recent Goodwill find. I wanted to match the blue in the plates, (my favorite color) so I bought a couple of yards of blue cotton fabric and made my own napkins. To make them for your table purchase 2.5 yards of cotton fabric (44 inches wide) in the color of your choice. Prewash and iron. Then split the fabric in half lengthwise and cut four sections to make 8 napkins. Finish them by using a simple overcast or zigzag stitch around the edges. You could also skip sewing and use pinking shears or turn over the edges with iron-on fusible webbing . I think the blue adds a nice pop of color. If you end up using cell packs from the nursery, cut them into individual sections. That will make it easier to tuck them in wherever necessary. The last simple table decoration idea I have is using a branch of the greenery to make a candle wreath. I did use some from the Trader Joe’s purchase but you could easily cut a branch from something in your backyard. Flowering shrubs like forsythia or crabapple trees that are starting to bloom in the spring would be perfect. Spring is a time for renewal and new beginnings. A great time to celebrate with all the wonderful people in your life. Use these ideas to help make it even more festive. P.S. Last year I shared my spring tablescape using vintage green glass and a very different centerpiece. You may also like this Easter Centerpiece using Easter Lilies. Did you know that you can plant them in the garden? Please Note: The posts for Wednesday through Friday will not be published until their respective dates. Love your centerpiece – it’s so full and beautiful! You’re eggshell planters are so sweet too. The place settings are just so cute! Love your tablescape ideas! Such a pretty tablescape, Patti! Love your gorgeous flower centerpiece! Trader Joe’s is the best for flowers. I always get mine there too. Thanks Kristi. TJ’s is a game changer when it comes to fresh flowers. Patti, your spring table is beautiful! Love the centerpiece and the little egg planters! Thanks Leen. They were so fun to make. Such a pretty tablescape! Love the centerpiece, full of spring flowers and the cute little moss and planter egg at each spot. Springtime tables are so fun to style, aren’t they? Lora, I couldn’t agree with you more. I think spring tables are my favorite next to Christmas. Hey there friend…I just did a ‘smack’ on the forehead! Your centerpiece idea is brilliant! I am so copying that for my Spring centerpiece. And those little egg planters…what a great idea. Your guests could easily take one home as a favor. Thanks Lynn. I’m sure your spring centerpiece will be gorgeous. If it helps this one lasted about 5 days before it even started to wilt but that was because some of the cups needed more water. Once I added the water they perked back up. So you can have one project out of the way several days before the party. Thanks, Angie. I’m so glad to be part of the tour. It’s always a great way to get inspired. Thanks for hosting. Patti this is absolutely gorgeous – everything is just so perfect. I couldn’t agree more about spring being a time of renewal. Love the custom napkins too – my grandma did that and sometimes added a little crochet on the edges. She loved her linens and I have a neat collection of them. Your table made me think of her, she loved dressing the table for a family meal. Thanks Carole. I always love decorating for the holidays in that room. It’s sad that it’s the only time it gets used. Your table is beautiful, Patti! I love your centerpiece and using small containers to hold the flowers is much easier than soaking oasis and then arranging and with the containers you don’t have to line the container to keep the water in. The salad plates that you found are beautiful and perfect for spring. They look great with the napkins you made and also the nests with eggs. I enjoyed seeing your table and I hope that on Easter Sunday it will be filled with family. Thanks, Paula. I hoping I can get a good group today for Easter Sunday dinner.